Step 1 Deciding if a drop ceiling is right for you. So you’re wonder if a suspended ceiling is right for your home or office. Let’s look at what a suspended ceiling is. A Suspended ceiling has many names attributed to it. Many people call it a Drop ceiling, False ceiling or a Suspended ceiling. You first need to decide if a suspended ceiling is right for you but in order to do that, you need to find out what a drop ceiling is and how it would fit for your particular application. Let’s look at that. Step 2 Why would you install a drop ceiling? A suspended ceiling is the most common and the fastest way to complete an unfinished area. There are a couple of reasons why you would want to install a suspended ceiling. To reduce sound transfer from one room to another. Or to stop sound from coming upstairs if you decide to put your kids’ playroom or entertainment center in the basement. To cover up those ugly pipes and duct-work that every basement has. In Homes drop ceilings are usually found in basements, however they have found their place in living rooms and kitchens as well. In office spaces you will usually find them just about everywhere. If you choose a 2×4 pattern, it tends to be more economical because there is less grid material; however, there are many more ceiling tile options if you choose a 2×2 pattern. 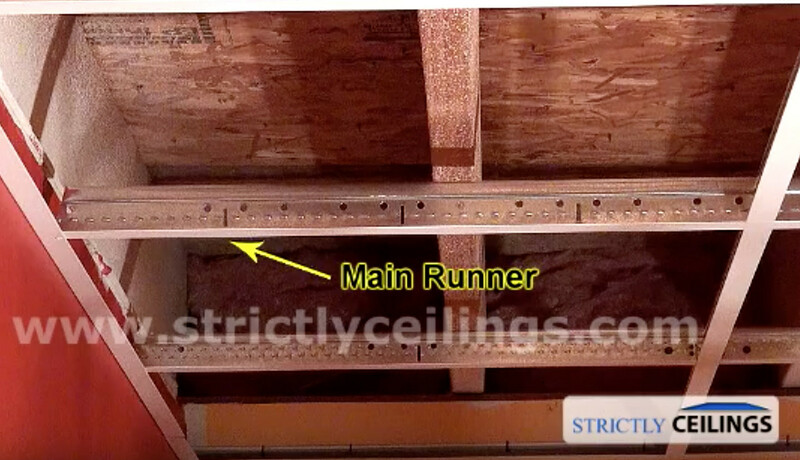 The Ceiling grid is hung from wires that are secured to your wood joists or the solid structure from above and those wires are spaced no further than 4’ apart from each other. This grid then sits on an L shaped molding called wall angle which is fastened around the perimeter of the room. 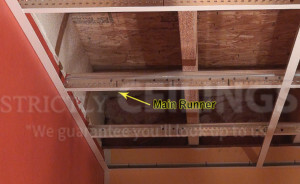 The frame members of the grid that carry the load of the ceiling are called main runners. These are also 12’ long. Main runners are installed every 4’ apart from one another and run the entire length of the room. Main runners come in 2 different sizes. You can purchase these in either the standard 1” wide face or the fancier 9/16” narrow face. Drop ceiling grids are also available in many different colors and styles. Determining the # of main runners for a particular job is quite easy. One main usually covers 50 square ft. of ceiling space. So in a room that is 500 square ft, 10 main runners are needed. Generally speaking you would want to add 10% for scrap so in this case we would purchase 11 mains. Each main has slots cut into the frame that are every 6” on center. These slots are where the cross tees connect into. The cross tees for a drop ceiling are either 2 or 4 feet long. The 4 foot long cross tees are the pieces that connect the main runners together. They simply snap or hook into the slots that are on the mains. If you have chosen a 2×2 layout then 2-foot cross tees are installed into the center of the 4 foot tees to create the 2×2 pattern. One thing you can do if you’ve chosen a 2×4 pattern is you can change the look of the room by changing the pattern of the grid. Some 2×4 grid patterns are installed so that the tile is running the length of the room giving the impression that the room is deep. Additionally, character can be added to any room by building a pan ceiling and giving the room a feel that would be more inviting then a normal ceiling. Click here to view pictures of vertical drops. 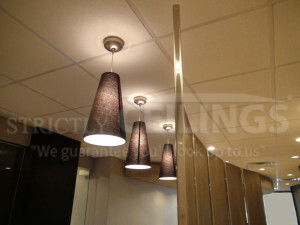 Finally, to complete your project, ceiling tiles are cut and installed into the grid to create a “Dropped” ceiling. The benefit of ceiling tiles over a standard drywall ceilings are that they are removable and provide access to the pipes and ductwork above them. Ceiling tile panels come in all different styles and thickness’ to accommodate the look that you would like to achieve for your project. 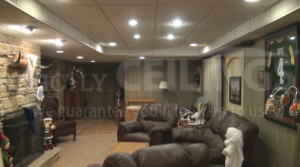 Check out our Ceiling Tile Showroom at www.strictlyceilings.com and view the many different tiles available based on your budget and application needs. Well, that’s about as basic as it gets. Maybe you’re thinking about installing a suspended ceiling yourself, it’s easy if you have the right person showing you how. Check out our “how-to” videos on Ceiling installation where we show you in detail how to install a suspended ceiling “the right way, the first time”. Slots – placed every 6″ to support tee runners.